Last year at this time, we were all consumed by teacher strikes in places where such actions were highly unusual. In fact, they were technically illegal. They were even more noteworthy because they were mainly organized outside of the formal union structure. Those 2018 strikes had another unexpected characteristic: They fit the common definition of a strike as an indefinite work stoppage. Any work stoppage can be considered a strike, but most of us think of strikes as a union tactic designed to exert pressure on management to meet worker demands. The strike ends when the demands are met, a negotiated compromise is reached, or the union calls it off due to lack of progress or support. None of us knew when the statewide West Virginia, Oklahoma and Arizona strikes would end. The same goes for the more traditional strikes that were held earlier this year in Denver, Los Angeles and Oakland as an outcome of failed collective bargaining. While allowing for the possibility that major actions are being planned out of my sight, there are few indications that strikes similar to those in 2018 are imminent. What we are seeing instead is a spike in teacher union mass advocacy centered on increased school funding and limiting charter schools. The next few weeks will see large-scale, union-organized rallies in a number of states: April 27 in Nevada, May 1 in North Carolina, May 8 in Oregon, May 16 in Massachusetts and May 22 in California. Only the North Carolina and Oregon rallies are scheduled during school hours, and Oregon is the only state where a walkout seems to be planned. So far, no one in authority has publicly suggested that any of these actions will be extended for more than one day. MAE President Joyce Helmick admitted the obvious to the Associated Press — that the phrase was a synonym for a strike. Teacher strikes are strictly prohibited in the state. 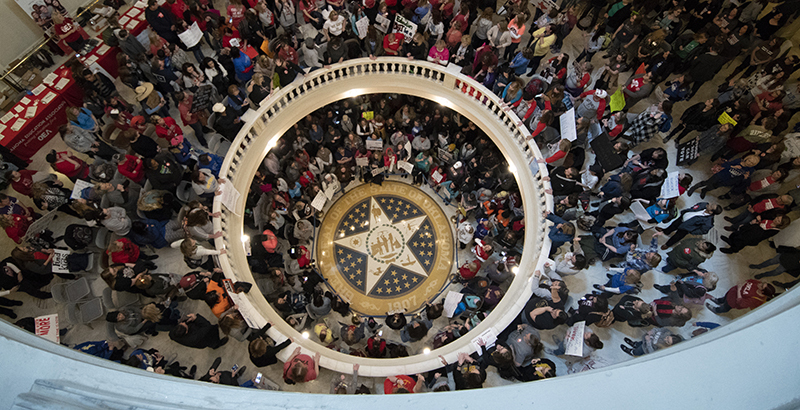 Legal ramifications didn’t stop teachers in red states last year, but MAE has a problem those groups didn’t have. It isn’t even the largest teacher organization in the state. Whether there will be any further grassroots teacher “uprisings” remains to be seen. But for now, it appears the teacher unions are channeling that energy into ramped-up, but familiar, avenues of protest.